Yes, another croissant, but it’s butter and more colorful. It was gently discussed earlier that maybe my Dr. Ph. Martin’s were not as vibrant as they could have been. So here is my second attempt. Plus, no coffee in this sketch, for those who dislike. Hrumph. Coffee haters, a whole other breed. Pfff! I think those Ph. Martin’s look pretty vibrant myself. And we all know, butter is better! Your food illustrations make me hungry. Wow, that has such depth and invites the viewer in. 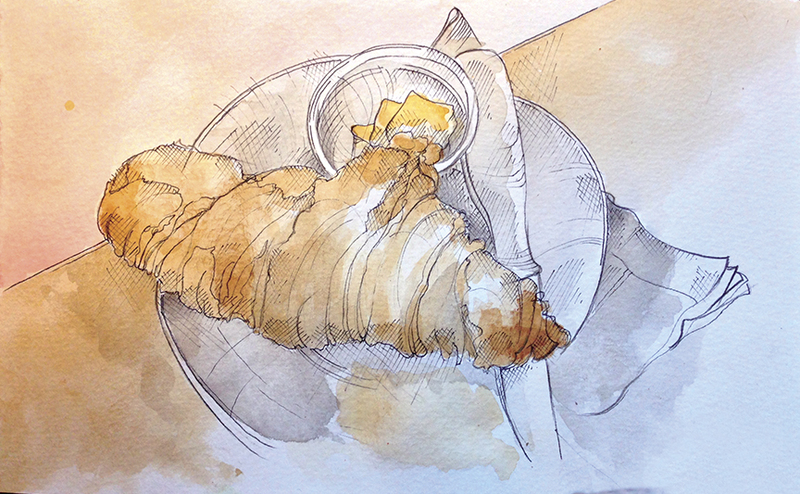 I am enjoyed whole wheat croissants lately … they’re quite good and buttery. I am rally liking my Dr. Martin watercolors. I can see why people are addicted to them. Gosh Rebecca, I wasn’t offended. Lovely. How can anyone hate coffee?